Tea with Granny, original mixed media tea cup painting, 18" x 18"
Two Bikes, original mixed bike painting, 24" x 24"
Pale Blue Bird, original mixed media bird painting, 12" x 24"
Elephant from India, original mixed elephant painting, 20" x 20"
Fish in Blue, original mixed media fish painting, 24" x 12"
This print is beautiful! I have several Kellie Day prints on canvas in my home and love them all. 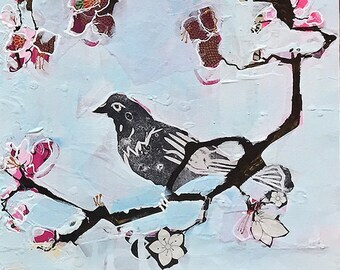 Her mixed-media artwork is vibrant, playful, whimsical, and unique. The prints are high-quality and capture the color and texture of the originals accurately. Kellie was great to work with and responded promptly to questions. Shipping was quick; I received this print much faster than Etsy estimated. I highly recommend Kellie Day's artwork for home, office, or anywhere you want to add a creative, colorful, fun statement piece. They make great gifts too! Thank you Kellie for making such inspiring art! I love Kellie's artwork. It's all so fun and whimsical. We have a small space and choosing a piece was hard but we decided on this print and LOVE it. The colors and funky multimedia are unique and beautiful. Kellie was prompt and helpful with responses to my many questions and totally accommodating to my requests. Shipping was fast. Thanks Kellie! Love the beautiful peony canvas! I admire all of Kellie's flower paintings so it can be hard to choose. The colors are vibrant and happy and I love being able to see the textures of the mixed media layers when seeing it up close. The canvas itself is heavy and top quality. I love all of Kellie's work - her art is fun, happy, and vibrant. It makes me happy! 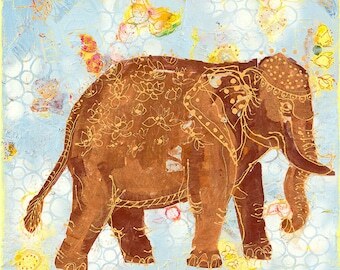 I have also ordered notecards from her and they are beautiful and on good card stock. Everyone I send one of her cards to comments on their uniqueness and beauty. Welcome to my shop! I am a mixed media painter from southwest Colorado. 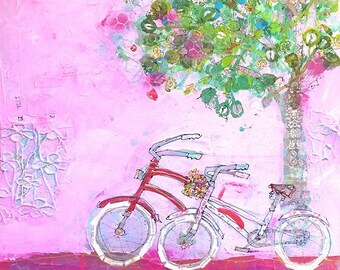 I am deeply inspired by the outdoors and paint richly textured, upbeat, collage works on canvas. Thanks so much for visiting, I hope my work will brighten your day! Please note that all sales are final, there are no returns or refunds. Shipping: All pieces are wrapped carefully and shipped and insured by either UPS or USPS. I ship often and everywhere, and will be sure to take the greatest care with your art.